Some couples have their morning coffee together, Christina and Gary are much more Silverback. We've got mother and son quality time programs as well. What the heck, bring dad, he might get something out of it too. 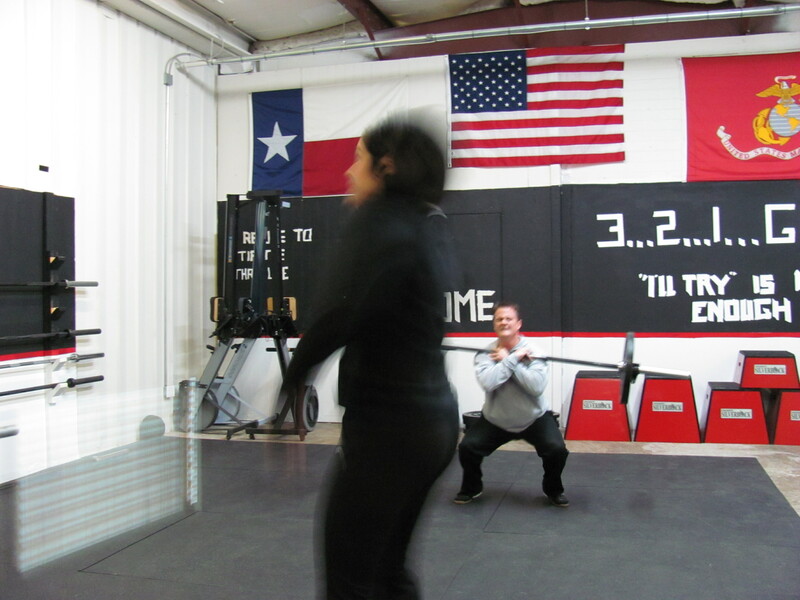 Hi all, just a quick plug for our upcoming work-party on Sat, Mar6th, after the WOD. We’re going to need lots of help of ALL skill levels. See the ‘Forum’ tab for details. I’ll be bringing a grill for a nice-Paleo lunch and will have a cooler full of ‘beverages’ too. It would be great if you could bring a Hammer Drill. I already have the bits but was planning on using my regular drill for the concrete. Other than that I should have everything covered. If I think of something else I let you know – thanks for offering!! WOW! This got heavy fast! I started the 8 reps and thought I would not make it to the end. Matt, thanks for the picture that makes me look like I can do pistols. I did 65lb and I think my time was 12:03 but felt more like 30:21. I think the push press was really my limiting factor. That was the only time I had to set the bar down. Brad, Missed ya this AM, you’re gonna love this one. Great to have Bear and LeAnn this morning. Yeah, you know how some look as easy as written and then turn out to be hard? Well, this one looks brutal as written. I’ll be there tonight. For the greatest adaptive response their is simply nothing better than slinging heavy weights with a sense of urgency. BIG Week here did 2 girl push ups on Monday and this morning … I DID A PULL UP!!! ok albeit it was on a red band and I had lots of “support” but progress, is progress. Glad to see Lynn up there with me. 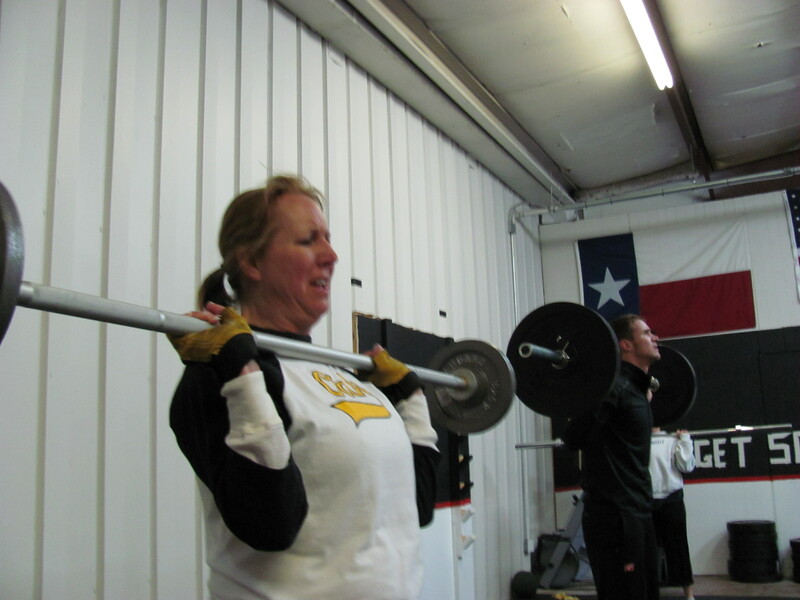 Did the WOD with a 45# bar and my time was 14:41. My new name….TAWANDA! (fried green tomatoes movie reference). I know you’re a giving person but haven’t you given up enough already?? I can’t believe I forgot to give a shout out to Lynn and Linda……Way to go girls!! I’m so proud of you!! Same on the DH’s as two weeks ago: 6-5-5, really need to work on this. 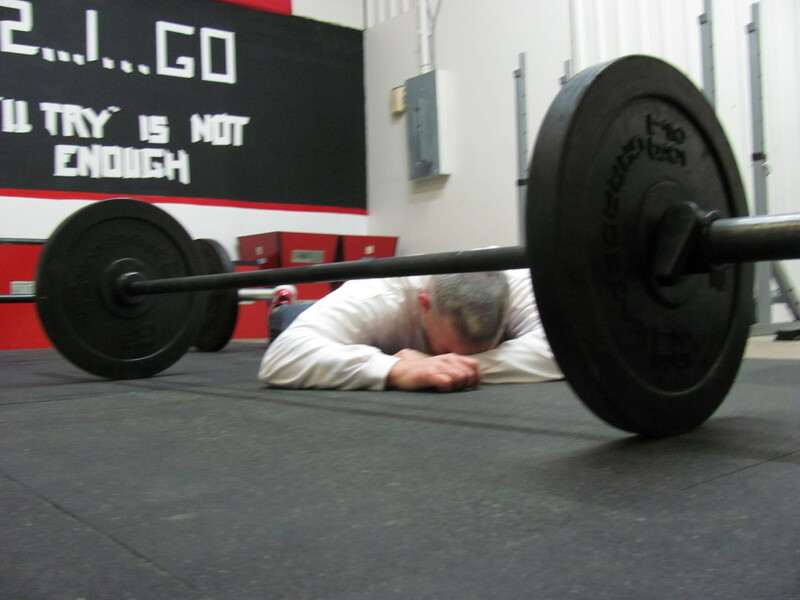 WOD was tough, did 14:37 (I think) w/a 95#bar. Thanks for rooting me on Nico – it really makes a difference when you know someones watching & cheering you on!!! Wow – did you go heavy Brad, great job!